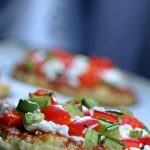 An easy and quick way to have pizza on the grill. The bonus is still having pizza on the weekends without heating up your house. Sunday Supper’s theme this week is Kids in the Kitchen. I have to say I love this idea. You all know mini-me helps me in the kitchen on occasion. I love for her to help make pizza. She actually works at a local pizza joint so she’s really good at making pizza. Like better than me. And I’m pretty darn good at it. Lots of practice. We make pizza a gazillion times a week. You learn some stuff. Like mini-me is better at stretching dough than her mom. Like loads better. She can make the perfect paper-thin crust. I mean thin as can be. You would be stunned if you saw this up close and personal. The dough is pure perfection. Apparently you get good at it working your way through University. If you are unfamiliar with Sunday Supper you can visit Family Foodie to get more information. It’s a group of bloggers led by Isabel Foodie who are committed to bringing Sunday Supper back to tables around the globe. It’s a wonderful movement and I’m proud to be a part of such a fabulous group. 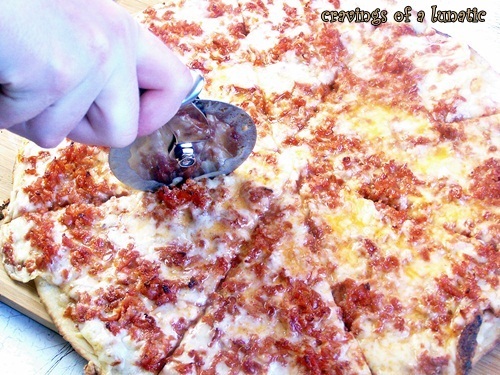 A pizza pan since this is a super thin crust. One with holes is ideal. 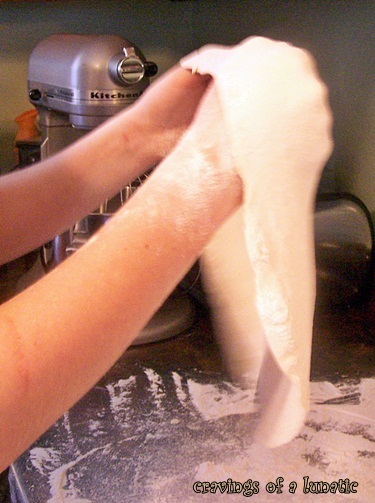 Roll and stretch your dough. Mini-me’s technique is to roll, then press with her hands, then hand stretch and throw. Do this until it’s thin enough to see through but it should not split or tear. Spray your pizza pan with non stick spray. Lay the dough on the pan. Reduce heat of the grill to a medium heat. Place pan in the centre of the grill. 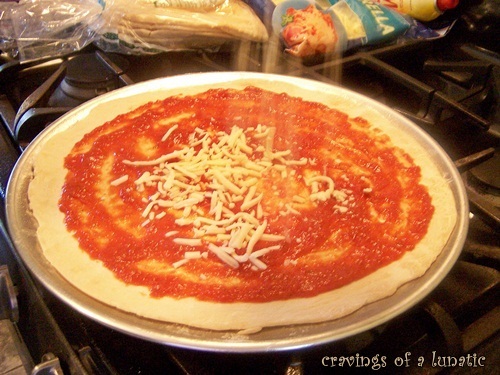 Allow to cook for 5 to 10 minutes, the bottom should be brown but not black, and the top should be golden and pepperoni just starting to turn colour. Remove very carefully with oven mitts after turning off the grill. Take inside and place on a cutting board. 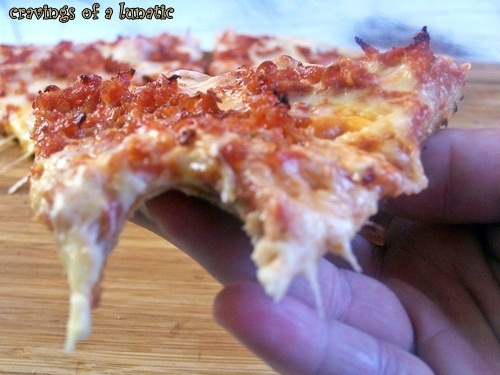 Use a good pizza cutter to cut into slices. Serve with an ooey, gooey, melty, cheesy smile! The cook time of grills can vary greatly. It depends on the size of your grill, whether it’s propane, charcoal or gas and how well it functions. So always use the bottom number I’ve given as a base number to start checking the food consistently. You need to get to know your grill and how it performs. The key to grilling is paying attention to the texture and look of the food. Do not walk away and ignore the food. Big mistake. But also don’t hover and keep opening the lid every 5 seconds. My best advice is to get to know how it works by grilling often and start small. Learn how to grill simple foods like hot dogs, burgers and veggies. Then you can move on to steak, chicken and even roasts. Do not fear the grill. Embrace it. But not literally cuz that’ll burn! Use your noggins! See that, best pizza mini-me’s made to date. This girl rocks the pizza. She doesn’t seem to like to grill though. Gonna have to change that. All girls should get their grill on. It’s not just a boy’s toy any more. Get in there ladies. Do not let the grill intimidate you. Here’s a little tip, if it was THAT hard do you really think men would be offering to do it all the time. Ya, nuff said. Okay so below is a peek at mini-me’s process. If you’d like to see more photos of her in action stop by our Deep Fried Panzerotti post. That will give you huge insight into how she does this amazing crust. 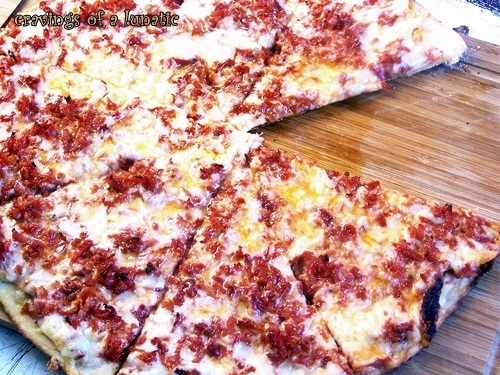 For now here’s a few photos for you of today’s pizza. I did not adjust from outside to inside light well so excuse any overexposed photos. Apparently I was tired and overworked today. So pretty much like any day around here. 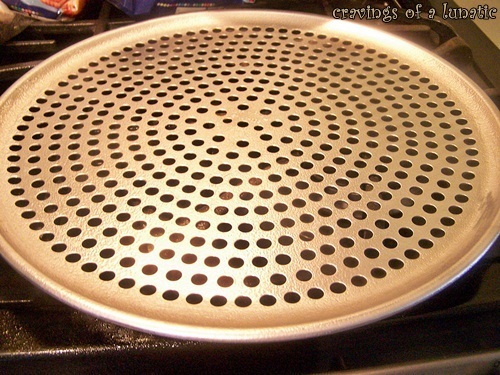 You want to use one of these pans if making paper thin crust! We got this at a small chef supply store in Windsor. She’s so fast I need to start shooting in sport mode from now on. She’s also really messy! She’s like a pizza ninja! Super fast spreading of the sauce! Ninja sauce! Ninja cheese tossing. That could be a new olympic sport! Pepperoni galore! I’m just guessing but I think she really likes pepperoni! Most ninjas do! She may have ninja pizza making skills but I have ninja pizza eating skills! So get out there and grill folks. 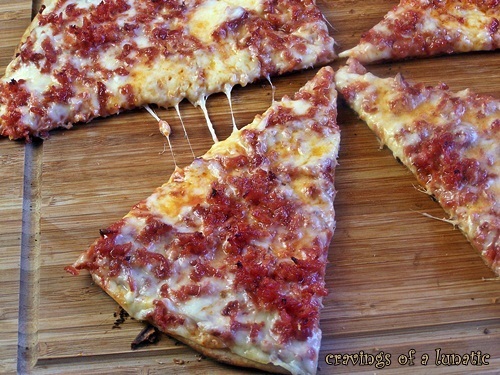 If you do a paper-thin crust I’d suggest using a pan with holes, or even a pizza stone. If your pizza is going to be thick you can toss the dough right on the grill. Cook the dough solo on one side for a few minutes. Then flip it over and move over to the low heat side, or turn one side off. Add your toppings, put down the lid and wait for the magic to happen. Honestly it’s really easy and quick. The grill will be your new best friend. So stop by some of my new best friends and say hello. These folks are all participating in Sunday Supper. I’d love for you to show them some Lunatic love. 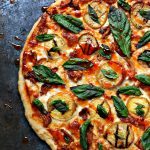 I’ve never grilled a pizza before but this looks pretty good! You gotta try it Maureen. It’s so good. Great idea for grilling pizza in the summertime to keep the heat out of the kitchen. Thanks so much Renee. I wish I had a stove in the garage as well as a BBQ outside. It’s on my wish list. My house gets so hot. It’s scorching here today. Over 100 right now. 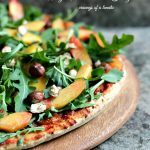 You are inspiring me to try Grilled Pizza…. 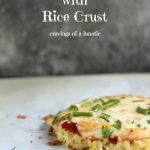 love this recipe and love the name even more! Thanks so much Dorothy. Mini-me sure knows how to make pizza crust. I want that pizza SO bad. I may have eaten it all. My bad. 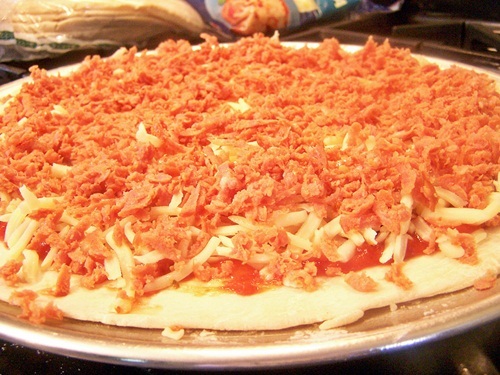 Mini-me’s work always does shredded pepperoni. At first I was resistant to it but now I’ve embraced it big time. It’s so good. I like the step-by-step pictures. Your pizza looks really yummy, especially at noon when I haven´t had a proper breakfast yet! Thanks. It would make a great lunch for sure. Love pizza for lunch. And dinner. And breakfast. This grilled pizza looks so cheesy and delicious. I need to get one of those pizza grill pans. Happy #SundaySupper! Thanks so much. You can get them at most Walmarts and places like that too. Happy #SundaySupper to you too. 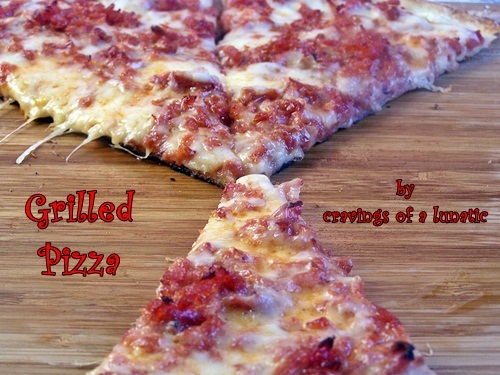 I tried grilling pizza once – it cooked instantly. (That’s another way of saying it, uh, burned.) I think my fire was too hot and it was way too windy to be grilling. You’ve inspired me to try again! It cooks super fast if the grill is not turned down. I’ve burned some stuff too. Like chicken. I always forget the juices drip. You gotta try it again. It’s so good. Oh yeah, pizza is always fun to assemble with the kiddos! It sure is. We are pizza addicts. You can’t go wrong with pizza! Definitely a good thing. Even better that the youngster is an expert at it. Thanks Jerry. Mini-me is a pizza expert. I’ve never grilled pizza! In fact I rarely make it (St. Louis, where I live, has some terrific pizza joints, 3 within 2 miles of my house – so it’s always take out for us). But I really do need to make pizza again someday, and grilling is a nice idea. And I have to say, it looks like Mini-Me has made pizza making skills! 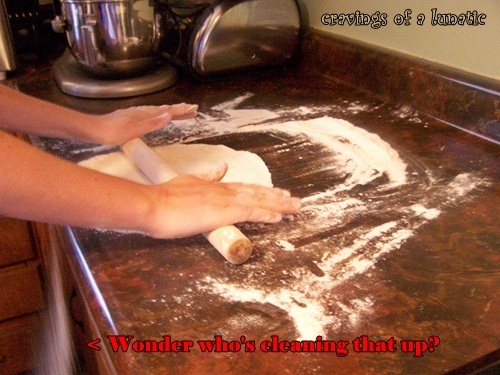 Stretching that dough is trickier than it looks. Fun post – thanks. You do live in a great pizza location so I can see why. We have about 6 pizza joints within 5 minutes, and my daughter works at one yet I still make it a couple times a week. We eat WAY too much pizza really. What’s funny is we live in a teeny tiny little town and we have a ton of pizza places. It’s so weird. Thanks so much. I love pizza. Could eat it every day. That looks so good. Now I want some pizza! Thanks so much. You must have some. Me too. We eat it way too much. I think we must have pizza at least a couple of times per week. Grilling is such a great way to do it in the summer. Anything to keep my house from being scorching hot. I love grilling my pizza. For my birthday last year my husband bought a pizza stone but we have decided that we actually prefer it on the grill. I love my pizza stone. It’s so amazing for pizza, but also for bread and cookies. I’ve been dying to try a grilled pizza. I didn’t know they made pans for it! I need to try this stat! The ones I bought are for ovens but they work on grills. If I’m not mistaken you can buy special grill ones. But they probably cost more and work the same. I use casserole dishes on my grill for things like potatoes too. You can put a pizza stone on them as well. Just know the pan won’t clean up as easily as it would if you used your oven. Takes a bit more elbow grease to clean. I’ve been know to use cast iron skillets on it too. Lol! I love grilled pizza. I just throw the dough right on the grill. Though when I do that, the shape usually ends up kind of, well, umm, rustic. I love rustic though. Rustic is awesome. Makes it more interesting. I picked up some of those ready made gf pizza crusts last week. Maybe I could grill them… In the mean time, I’ll go get the rag to mop up the drool on my computer screen. I am so glad you found gf crust. Super yummy and good for the bellah. 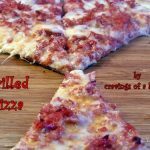 It such a great idea of grilling pizza….must try! It’s so good like this. Rustic is totally fun. I love a rustic pizza. I love when gals grill. It’s so much fun. Two words…. yes, please. Ok, so that was four words but still. 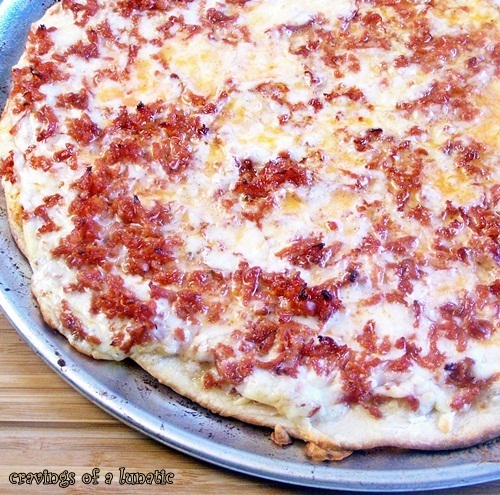 Damn, now it’s fifteen, seventeen, eighteen, *runs screaming in search of this pizza. I had one of those old grocery clickers ready for this one. Thanks so much Lea. You are most welcome for the pictures. Hope it helps. You and Mini Me are pizza maestros. Thanks for encouragement about grilling. Love your statement about how hard can it be if the men folk are offering up assistance to grill. Tee hee. Kim, I have to tell you that this post actually made me go on-line and buy a pizza pan for use on the grill! 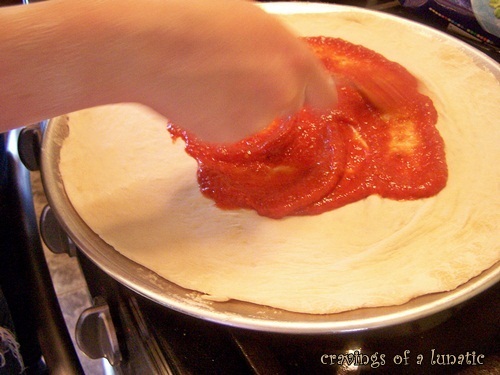 I used the Chef Boyardee pizza dough mix for the dough and using a similar size round pan lined with parchment I pressed the dough out and then flopped over to transfer it to the pizza pan so I wouldn’t press the dough thru the holes. On charcoal medium coals it only took 5-7 minutes on direct heat. It was the BEST!!! Your photography of the process inspired me, great job and great ideas!!! You and Mini rock!